Available in 5 color options. Click any of the 'Buy It' links below to see the color options available at each store. double-handle with strap drop of 10"
Additional none with strap drop of 0"
This authentic Michael Kors tote is made of brown, Saffiano leather. 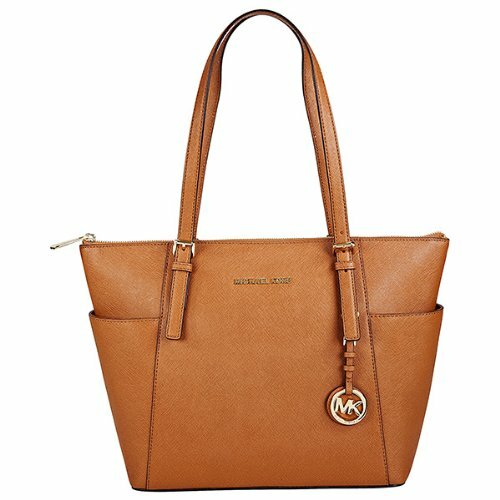 This Michael Kors handbag features gold-tone hardware, two shoulder straps, a top zip closure, two exterior slip pockets, interior slip and zip pockets, a keyfob, and a signature Michael Kors logo medallion. Measures 11" L x 5" W x 14" H.
A Michael Kors Jet Set tote crafted in saffiano leather with silver-tone hardware and a fully lined interior. This Michael Kors Jet Set tote features two main zip pockets, a center zip pocket and interior wall pockets; two chain leather handles with a 9.5" drop. DiMen'sions: 17" x 10.5" x 6". Store: ravus94 Condition: Brand New Price: $177.99 Total Price: $177.99 Buy It from ravus94 No returns. Michael Kors Emmy Large Top Zip Backpack Tulip Pink Saffiano Leather $348 *nwt*! Store: 41gaerlu7088 Condition: Brand New Price: $179.00 Total Price: $179.00 Buy It from 41gaerlu7088 No returns. Store: usdream1 Condition: Brand New Price: $179.85 Total Price: $179.85 Buy It from usdream1 No returns. Store: allaboutdream Condition: Brand New Price: $176.99 Total Price: $176.99 Buy It from allaboutdream No returns. Last updated: April 18, 2019 at 12:11 EST. Pricing information is provided by the listed merchants. GoSale.com is not responsible for the accuracy of pricing information, product information or the images provided. Product prices and availability is subject to change. Any price and availability information displayed on amazon.com or other merchants at the time of purchase will apply to the purchase of the product. As always, be sure to visit the merchant's site to review and verify product information, price, and shipping costs. GoSale.com is not responsible for the content and opinions contained in customer submitted reviews.